This statement invitation is graphic and eye-catching with a bow tie pattern, metallic copper foil-stamping, and a bi-color design. The piece is flat printed single-sided on luxuriously thick cover stock with a subtle eggshell textured finish with the names richly foil-stamped in a metallic copper sheen. 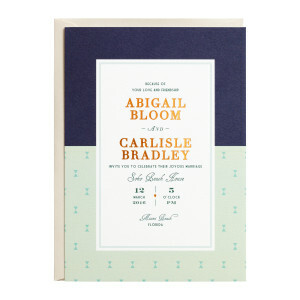 $1,615 for 100 flat printed and foil stamped, or $507 for 100 flat printed Invitations and matching matte colored Envelopes.